Results of Alterian’s SM2 World Cup analysis shows that despite its general lack of enthusiasm for soccer, the U.S. generated the most social media buzz of all participating countries. Alterian (LSE: ALN), the leader in customer engagement technology and solutions, today announced the findings of its comprehensive study that tracked the volume, sentiments and extent of conversations that happened online throughout the duration of the World Cup. 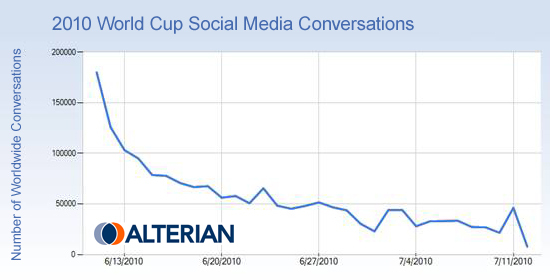 The analysis, which used Alterian’s SM2 product, indicated that U.S. consumers were the most active social media conversationalists throughout the tournament —despite widespread belief that soccer ranks as the country’s least popular sport. World Cup champion, Spain, came in at No. 7 in overall number of social media conversations and No. 6 in the last two days of the tournament. Unlike previous World Cup tournaments, excitement surrounding the games could be tracked via social media channels. Results showed the U.S. ranked No. 1 in volume of conversations throughout the entire World Cup, with a total of 1,024,628 conversations. When ranked relative to the number of Internet users, host country South Africa had the highest volume of conversations throughout the World Cup. In addition, Alterian analyzed the sentiment of online conversations, finding that Germany displayed the most positive sentiment throughout the World Cup, with more than half (59 percent) of its conversations ranking in this manner. On the other hand, France displayed the most negative sentiments throughout the World Cup. Twenty-eight percent of its conversations expressed some kind of pessimistic commentary, likely a result of the team going home in disgrace following player and management disputes. Although social media usage has surged since the last World Cup, Alterian’s analysis found that each country has a platform of choice. Microblogs like Twitter were the most popular social media platform globally, with 40 percent of all World Cup online conversations occurring in this space. Eighty-seven percent of Japanese conversations happened on Twitter, making it the No. 1 country communicating via microblogs. About 43 percent of U.S. conversations occurred on microblogs. Traditional blogs were most widely used by Brazilians, however, with 52 percent of Brazil’s conversations occurring in the blogosphere. Only 13 percent of U.S. conversations occurred on blogs. However, the U.S. took the lead in the amount of conversations occurring on Facebook and other social networks. The percentage of conversations, 11 percent, was still higher than any other country. Other Alterian findings across platforms indicate that France prefers to communicate via online forums (41 percent) and Italy leads in the usage of video and photo sharing sites, at nine percent. Alterian’s SM2 social media monitoring tool tracks online noise and sentiment across an infinite number of social media and online channels, and boasts a dictionary consisting of 16 languages. The 2010 World Cup social media analysis was generated from the opening ceremony through the final whistle, and tracked noise levels in relation to country Internet usage as well as overall volume of conversations. Throughout the World Cup games, SM2 recorded a total of 1,870,085 conversations online. Alterian (LSE: ALN) enables organizations to create relevant, effective and engaging experiences with their customers and prospects through social, digital, and traditional marketing channels. Alterian’s Customer Engagement solutions are focused in four main areas: Social Media, Web Content Management, Email, and Campaign Management & Analytics. Alterian technology is utilized either to address a specific marketing challenge or as part of an integrated marketing platform, with analytics and customer engagement with the individual at the heart of everything. Working alongside a rich ecosystem of partners, Alterian delivers its software as a service or on premise. For more information about Alterian visit http://www.alterian.com or the Alterian blog at http://www.engagingtimes.com.